Obituary of Nancy Staton Boykin. Wilson Daily Times, 14 December 1946. In the 1870 census of Deep Run township, Edgecombe County, North Carolina: farmer Jarrett Staton, 34; wife Penina, 32; and children Henry, 18, William, 15, Louisa, 12, Nancy, 10, Hoyt, 7, and Ida, 4. In the 1920 census of Wilson, Wilson County: at 713 Viola Street, midwife Nancy Staten, 52, widow; house carpenter James Jenkins, 24, and wife Annie, 19. Nancy Staton, 55, married James Boykin, 56, on 22 December 1927 at the bride’s home in Wilson. Glenn S. McBrayer applied for the license, Christian Church Colored minister B.J. Gregory performed the ceremony, and McBrayer, Lillian McBrayer and Bettie Whitley were witnesses. In the 1928 Wilson city directory: Boykin James (c; Nancy) carp h 800 Viola. In the 1930 census of Wilson, Wilson County: at 900 Viola, owned and valued at $4000, practical nurse Nancy S. Boykin, 59; husband James Boykin, 44, Christian church clergyman; daughter Lila R. Boykin, 19; and two lodgers, Ines Williams, 23, and Minnie Nelson, 20, who both worked as servants for private families. On 28 February 1937, Jarrett Z. Staton died in Wilson. 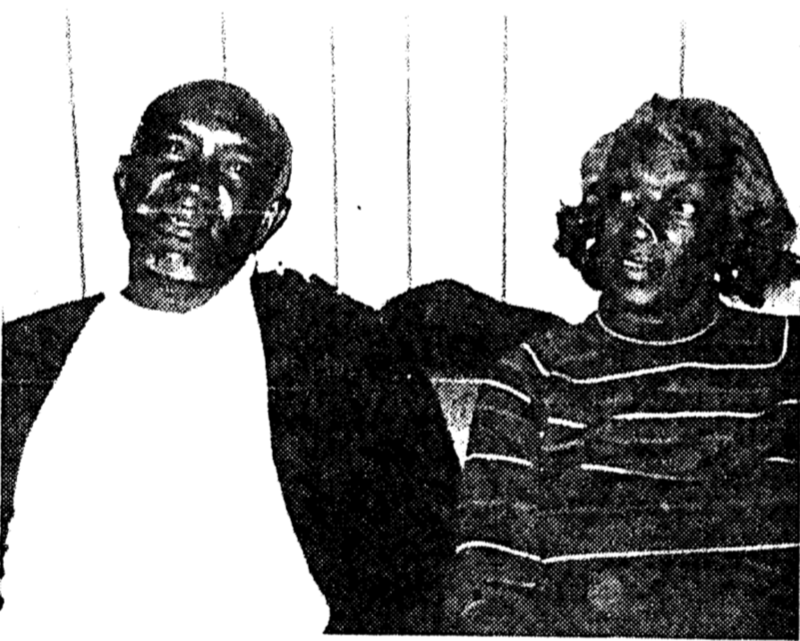 Per his death certificate, he resided at 905 Viola Street; was 66 years old; was born in Edgecombe County to Jarrett Staton and Penina Thomas; was divorced; and had worked as a laborer. Informant was [his sister] Nancy Staton Boykin, 812 East Viola Street. In the 1940 census of Wilson, Wilson County: at 812 Viola, owned and valued at $1500, James Boykin, 60, and wife Nancy, 79; and, renting at $12/month, Lucias Smith, 28, skilled sewer contractor laborer, wife Jacqueline, 18, daughter Louise, 2, and Sidney Ramsouear, 89; and, renting at $4/month, Ray Brockman, 33, skilled sewer contractor laborer, and wife Hattie, 22. The Smiths and Brockmans were from South Carolina. 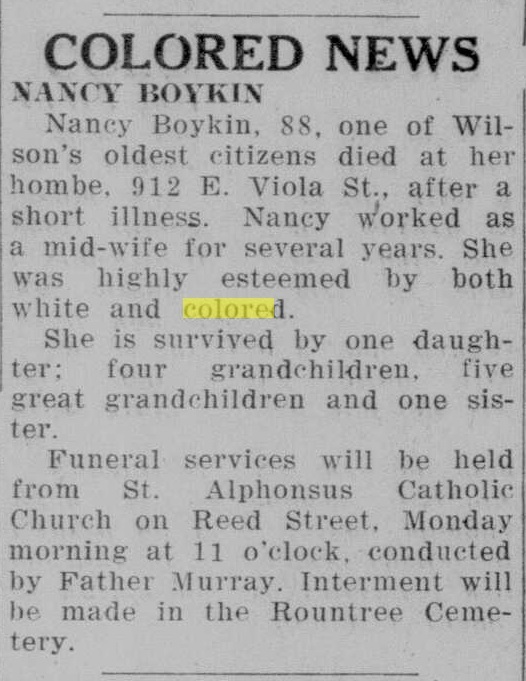 Nancy S. Boykins died 12 December 1946. Per her death certificate, she was 88 years old; was born in Edgecombe County to Jarrett Staton and Pennina [last name unknown]; resided at 812 East Viola; was a retired midwife; and was buried in Rountree cemetery. Nina Pitts of East Vance Street was informant. Best and Marjorie Fulcher Stewart. “Best Stewart was born into the household of Ellen McCoy and Louis Stewart in Wake County, North Carolina, on December 24, 1912. He was the youngest of fourteen children …. As a young man in the Wilson area, Best started his career in real estate and super market business. “Marjorie Fulcher was born into the household of Barthena Best and George Fulcher on October 26, 1917, in Wilson, North Carolina. She was the second of five daughters: Hancey Lee, the oldest, and Ernestine, the youngest. She was raised in the area called ‘Grab-Neck’ on the east side of town adjacent to the area known as ‘Daniel Hill.’ Her mother was a holiness preacher. “Best Stewart started his supermarket business as a very young man. He was a successful businessman with the assistance of his wife, Marjorie, at his side. He can be described as a brick-mason, community leader, gardener, fisher, and hunter and electrician. Even though he never completed his secondary education, he was a self-educated success. “Marjorie was nicknamed ‘Dorgie’ by her family. … She was a warm, loving, easy-going, quiet and caring sweet wife and mother. She was also a business partner with her husband. “In 1960 the family moved from the area known as ‘Daniel Hill’ because of the urban renewal project in the Wilson, N.C. area. Even though Best moved his family to the east side of town, he was determined to come back to his home area. In 1970 Best moved his family back to the area which was once known as ‘Daniel Hill’ where new brick homes were built. In 1974 they retired from the supermarket business. On 11 June 1913, George Fulcher and Barthena Best, both 22, were married by A.M.E. Zion minister B.P. Coward in Grabneck. Ernest Allen, Jesse Barnes and James Daniel were witnesses. Marjorie Bethena Fulcher was born in 1917 to George and Bathena Best Fulcher in Wilson. Geo. Fulcher registered for the World War I draft in Wilson in 1917. Per his registration card, he was born 14 September 1891 in New Bern, North Carolina; resided on Nash Street in Wilson; worked as a delivery boy for Patterson Drug; and was married with one child. In the 1930 census of Wilson, Wilson County: at 605 Spruce Street, barber Sam Right, 25; wife Bula, 20; mother-in-law Ellen Stewart, 50, widowed laundress; brothers-in-law Lewis, 18, and Bess, 16; and daughters Myrtle E., 4, and Ready G. Wright, 2. 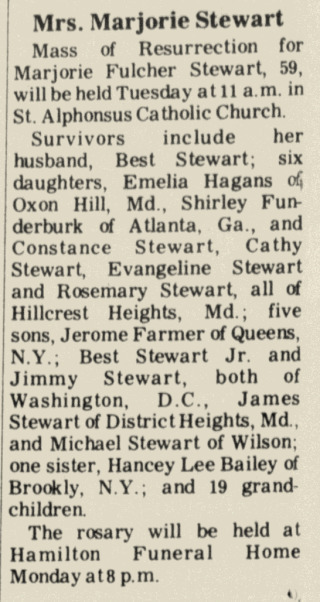 On July 6, 1937, Best Stewart, 25, of Wilson County, son of Louis and Ellen Stewart, married Marjorie Fulcher, 19, of Wilson County, daughter of Bathena Fulcher Lassiter. Bathena Lassiter applied for the license, and A.M.E. Zion minister B.P. Coward preformed the ceremony in Grabneck in the presence of Ernestine Fulcher, Bathena Lassiter and Wms. Bunn. In the 1940 census of Wilson, Wilson County: at 409 Spruce Street, retail salesman Best Stewart, 38; wife Marjorie, 27; and children Best Jr., 2, James A., a newborn, and Ellen, 70, mother. In 1940, Best Stewart registered for the World War II draft. Per his registration card, he was born 24 December 1912 in Fuquay Springs, North Carolina; resided at 409 West Spruce Street, Wilson; was self-employed at Best Stewart’s Place; and his contact was Mrs. Marjorie Fulghum Stewart. Best’s brother Louis Stewart also registered. His card notes that he was born 22 April 1909 in Libby Springs, North Carolina; resided at 409 West Spruce; worked at Export Tobacco Company; and his contact was his mother Ellen Stewart. Ellen Stewart died 6 April 1960 at 409 West Spruce Street, Wilson. Per her death certificate, she was born 2 October 1881 in Harnett County to John and Neily McCoy. Informant was Best Stewart. Wilson Daily Times, 27 August 1977. Wilson Daily Times, 17 November 1980. Text and photo courtesy of History of Wilson County, North Carolina (1985). Suffer the little ch… on Rev. Halley B. Taylor.